My partner and I celebrated our 21st anniversary this year. Now we have spent longer together than we have apart! As legislation has caught up with us, we decided to get married. After 21 years, we gave ourselves just 2 months to plan the whole thing to coincide with family visiting from abroad. There are many stories and lessons I could share from the wedding planning process. Maybe some other time. 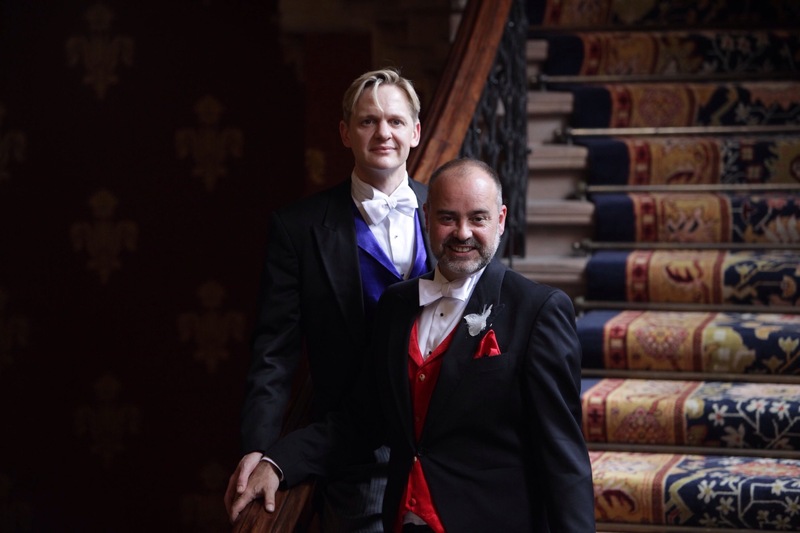 This blog will concentrate on one element of the wedding preparations… The waistcoats! 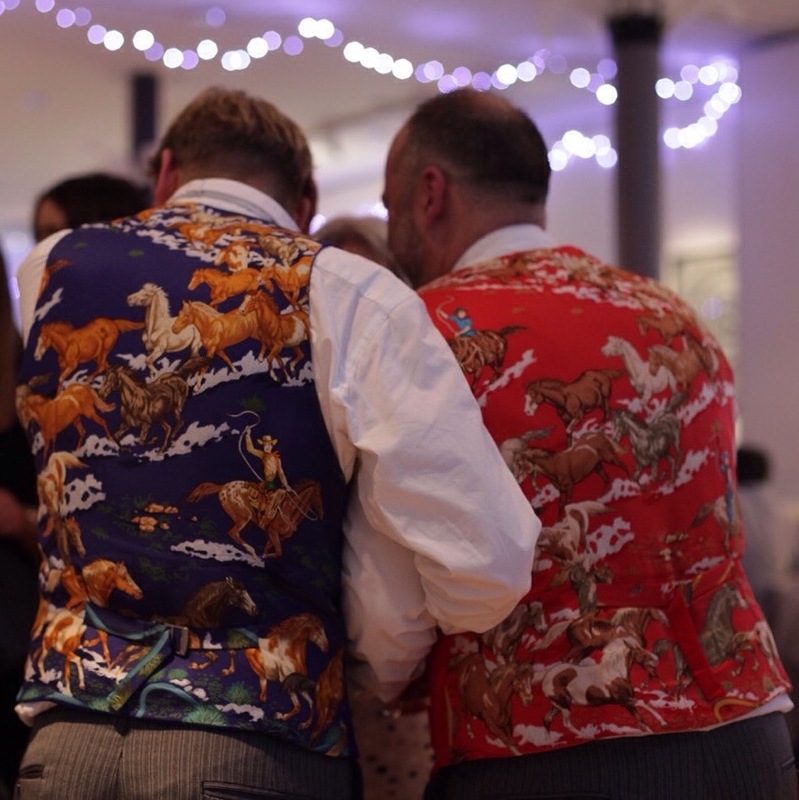 Very early on my partner wisely suggested that I make only the waistcoats for our wedding outfits. I had ambitions to create two bespoke three piece suits, but, having had only moderate success with trousers and just one (dubious) jacket under my belt (see previous blog!) I took his advice. And thank goodness I did. We decided early on for traditional morning suits. 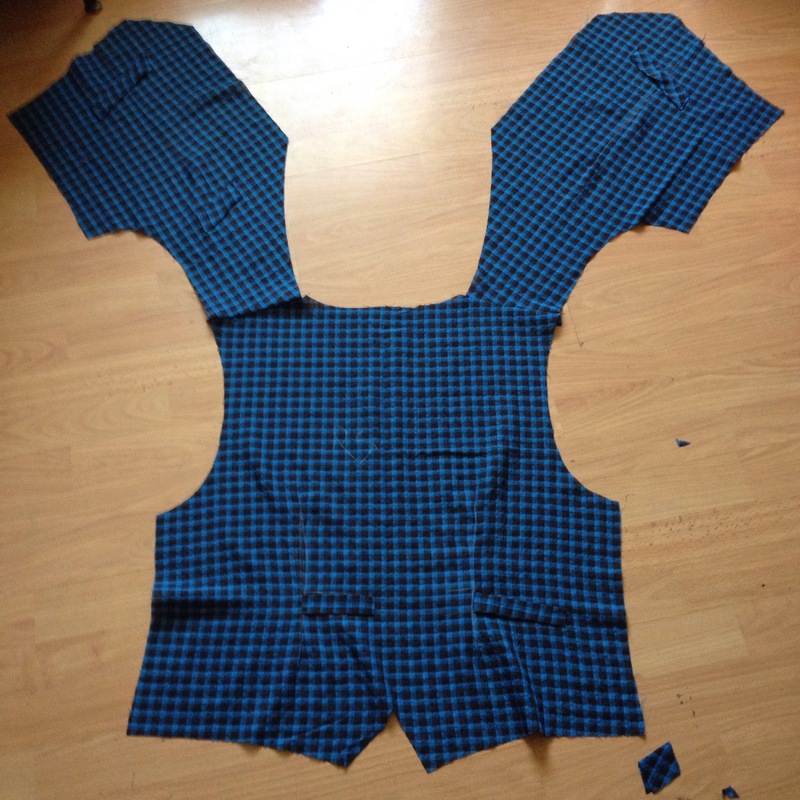 The waistcoats would be plain on the front and have an interesting back. The same design but maybe different colours. I was going to do both of us, make a swirly frame and alternate directions. 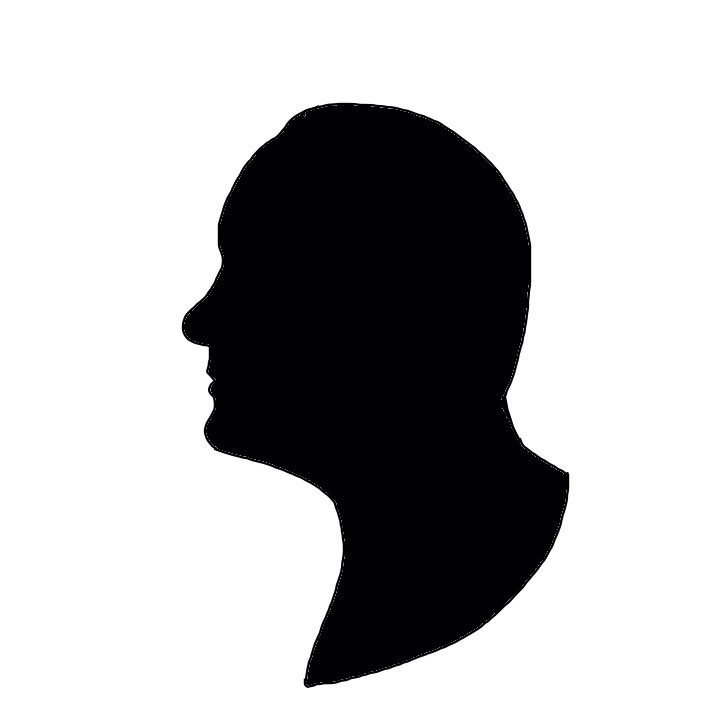 I only got as far as the initial sketch before a better idea came up. Two beautiful, silk, Hermes scarves. ‘Les Mustangs’ design, one in blue one in red. RRP £270 approx. 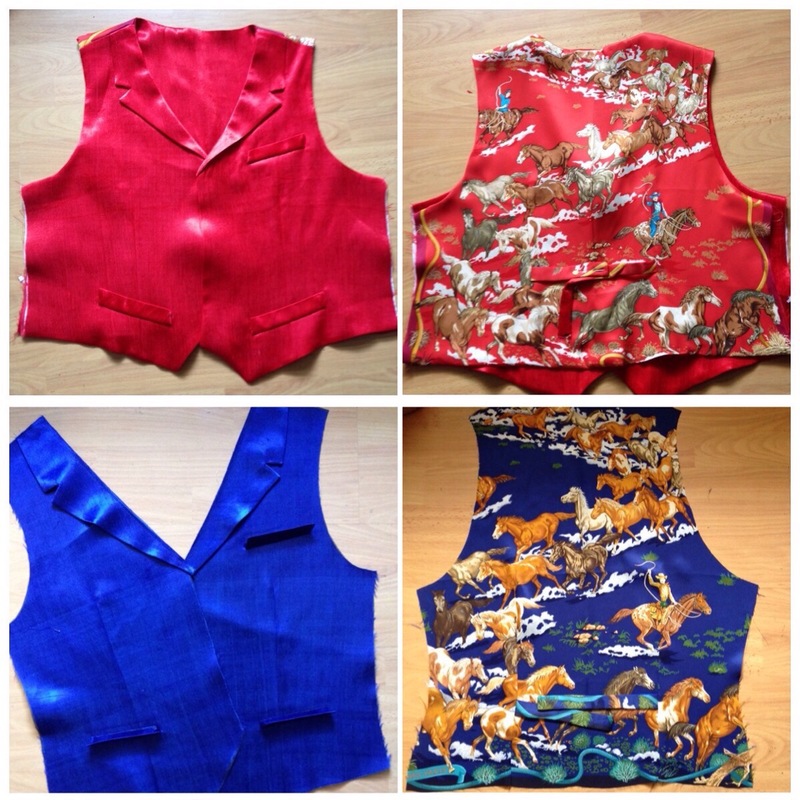 I’d made a few waistcoats before. 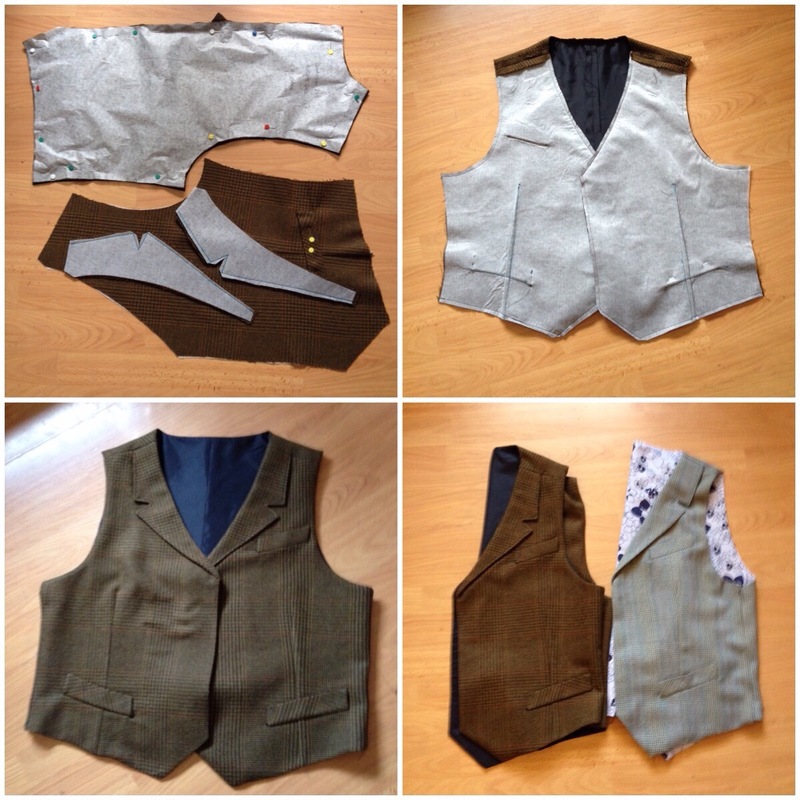 In fact, a waistcoat was the first garment I made when I graduated from bags and wallets. 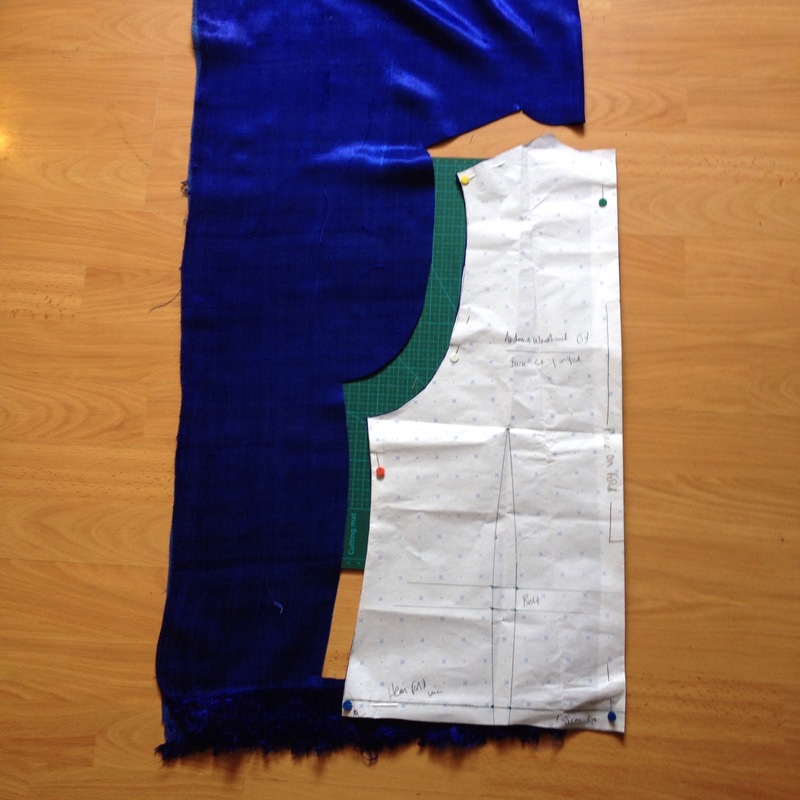 I had to mix up a couple of patterns and do a bit of drafting to get the features I wanted. Back darts for ties. No centre back seam. Whenever I start changing a pattern I am always reminded of what an amateur I am. I research thoroughly, really feeling like I understand the subject. I’ll get the tricky bits okay, then make loads of grade 1 errors, forgetting to add/ remove seam allowance for example. There is a piece of paper in with each of my patterns with notes on what tweaks to try next time. My pattern envelopes are fat with all the extra adapted pieces and notes. I took the scarves to the Cloth House in London’s Berwick street to get matching silks for the fronts and linings. £20 a metre, I got 1.5 of each. MacCulloch and Wallis for the softest lightest iron on interfacing. Then to Kleins on Noel street for thread and buckles. I couldn’t stop myself from popping into Tailors Buttons on Cleveland street too. It’s always worth picking up some new shirt buttons. It was great to go to my 4 favourite shops all in one day. 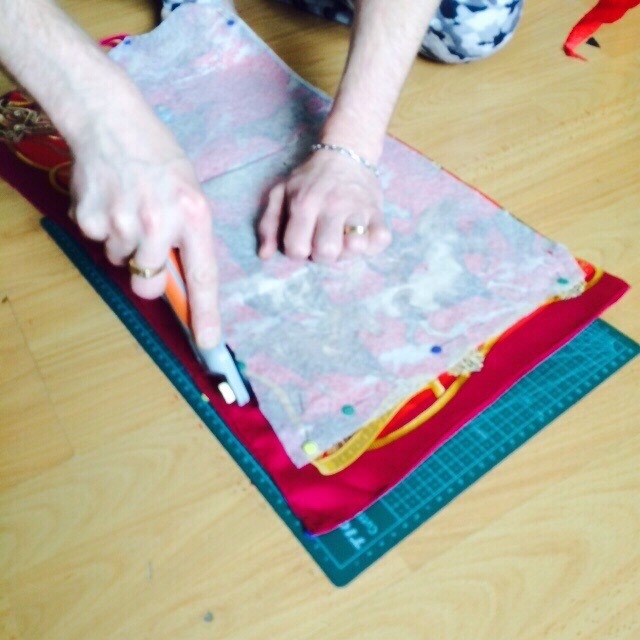 Euphoric… Shamanic… Like a sewing-spirit-quest! Then I couldn’t put it off any longer. Time to cut into the scarves! As you can see, I was cutting it a bit fine. The red one in particular didn’t leave much room for error! 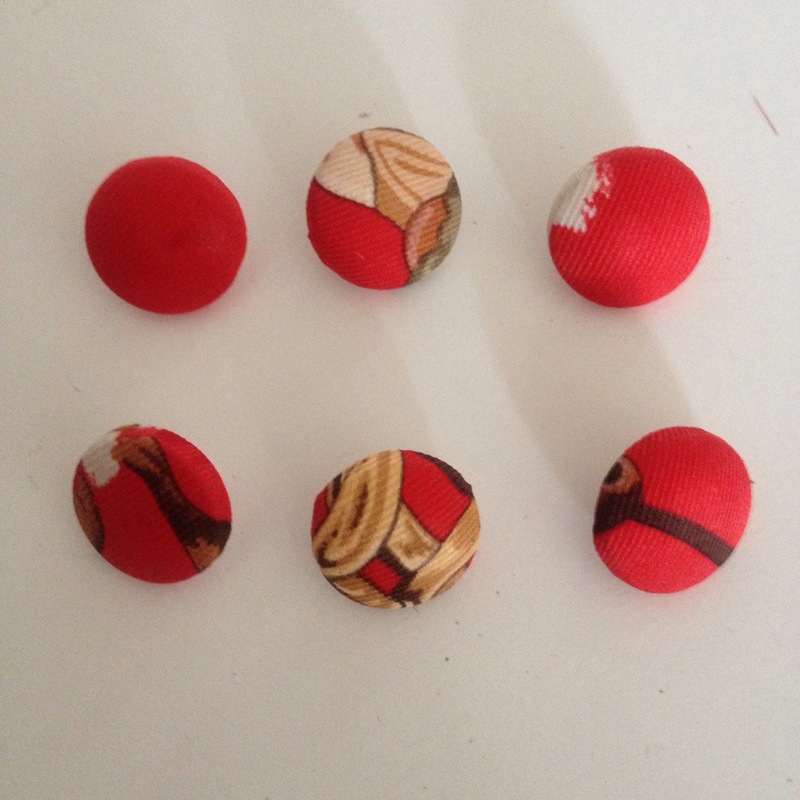 I did however manage to eke out enough scraps to cover the buttons. A very good friend came to watch over me and keep me calm (& stop me before I make any school boy errors!) for which I shall always be grateful! (Gratitude must also go to my walking foot, without which it would have been quite a different story). 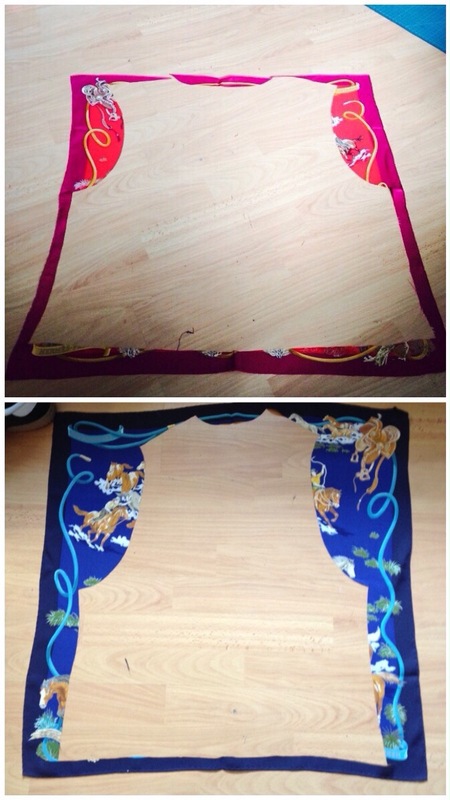 Once I cut into the scarves, they became fabric again and I really enjoyed working with such a beautiful materials. We had an amazing day. I was a bit of a reluctant groom to be honest. Happy to be married, apprehensive of a wedding. 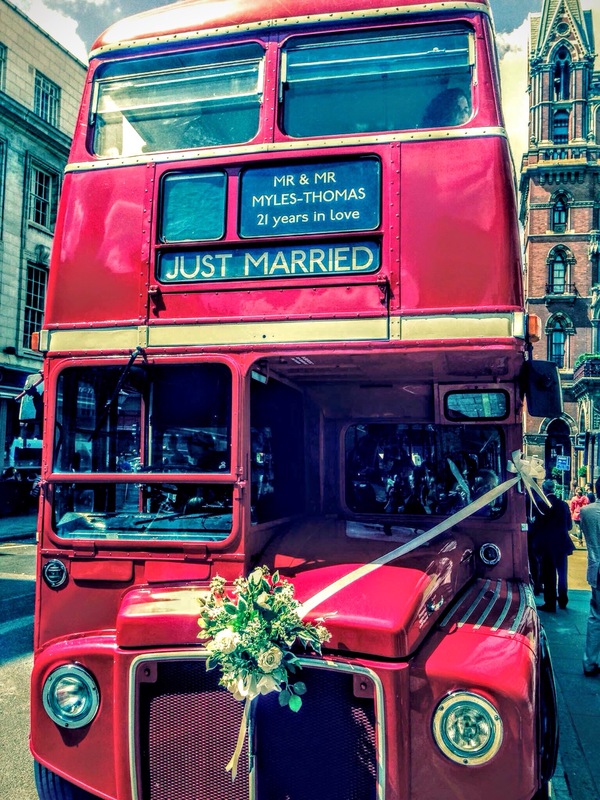 But I’m so glad we went for it because we had the best day ever. Congratulations! You and your partner make quite the handsome couple! The waistcoats are absolutely stunning! Hermes would be proud. Thank you very much! I’m busy finding any and every excuse to wear it now!